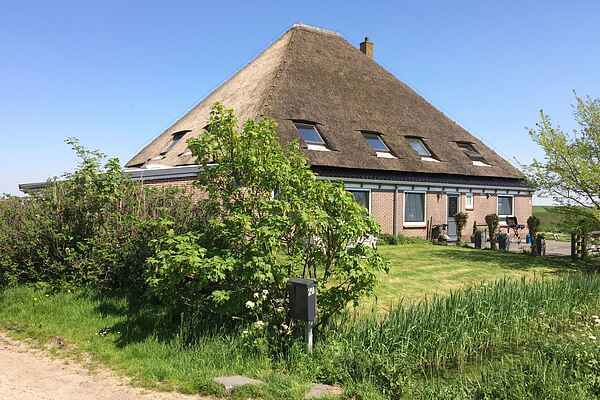 A charming holiday home in the middle of the polder, with views of the Camperduin dunes. The home for six people is part of a characteristic farm. The owners reside in the other part. The house covers a quarter of the farm. The holiday home is entirely on one level. The three bedrooms are adjacent to the living room. From the apartment you have a lovely view over the countryside. You can walk to the beach in fifteen minutes and within twenty minutes to the cosy village of Groet. There you will find a few lovely restaurants. The ancient Hargerpolder is historic land. The dunes rise up at the end of the dyke. “De Schoorlse Duinen” is a unique natural area. The dunes separating the sea from the land, are 7 km wide, making them the widest dunes in Europe. You can walk or cycle endlessly here, for example in the direction of the bird sanctuary. This place is ideal for those seeking peace and nature. Cows, sheep and horses wander in the meadows.